"Take a look at these fun Scavenger Hunt List Ideas - from simple A to Z and itemized scavenger hunt lists, to the scavenger hunt list with codes, riddles and puzzles for the kids to decipher..."
This scavenger hunt list idea can work with just about scavenger hunt theme in any location, but works particularly well as an indoor scavenger hunt or backyard scavenger hunt for groups of young kids who are too young to go hunting away from home. The teams can search for items in any order and once a team has identified an item beginning with a certain letter, they simply strike off that letter and move on to the remaining letters of the alphabet. The kids can either be instructed to collect one of each item on the scavenger hunt list and pop each into a bag to bring back, or they can simply make a note of each item discovered and tick the letter A, B, C, etc. from their lists. Slightly more challenging than the previous two scavenger hunt list ideas, is the item characteristics list idea which is better suited to slightly older children. Depending on the nature of your list and the variety of characteristics you will probably find it easier for the kids to simply make a note of the items rather than try to collect them. 12 number "12's" on any items in the area - buildings, cars plates, t-shirts etc. Having the kids pitting their wits against 'puzzling puzzles', 'tongue-twisting riddles' and 'baffling brain-teasers' is probably the most challenging of the scavenger hunt list ideas; After all, solving the puzzles and cracking the codes is a tough challenge in itself, even before the teams have begun their hunt for the items! Although the difficulty levels of the clues can be made suitable for younger scavenger hunters, these types of scavenger hunt lists are best suited to kids of 10 years and above. It is also at this age that the kids find these clues the most fun to solve. 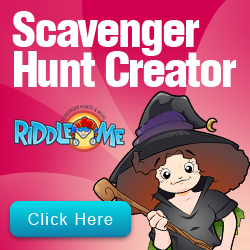 There are lots of different types of scavenger hunt clues - from word, number and picture puzzles to secret codes and ciphers - and you can find more details and examples of these on our scavenger hunt clues page and scavenger hunt riddles page.